There are several stray dogs living at our field site that depend largely on food brought by tourists intended for the monkeys. 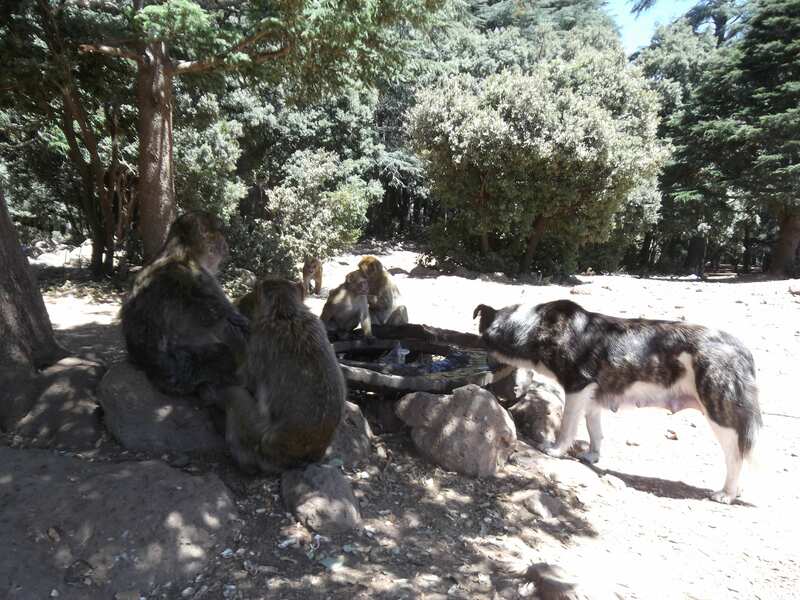 Although dogs are a potential predator to Barbary macaques, these dogs seem to be aware of this and do not attack them. Conversely, when the macaques sound an alarm call against a potential predator we have observed that the tourist dogs would chase the threat away. Thus, our group is strongly habituated to their presence and both species seem to coexist harmoniously. The “tyre” is a popular water source for both dogs and monkeys. 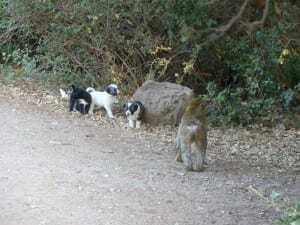 Recently, some of the females have given birth and now the place is crawling with puppies. Juveniles and infants have been especially intrigued by the new faces and approach quite close for a better look. One day, one of the puppies seemed to have lost itself from its mother and the rest of the litter and kept calling out for its kin. The call attracted Galack, a young adult male as well as several other monkeys. Galack sat within a metre of the puppy, simply starring at it before deciding his time would be better spent foraging leaves of the surrounding bush. Moments later some kids came, also attracted by the calling puppy. One of them threw a stick to scare the monkeys away and moved in to grab it. However, Galack and a few others were clearly not happy with this as they charged at the child with facial displays to scare him away. A few minutes later the same thing happened again which made me think that the monkeys were trying to scare the children away from the puppy. 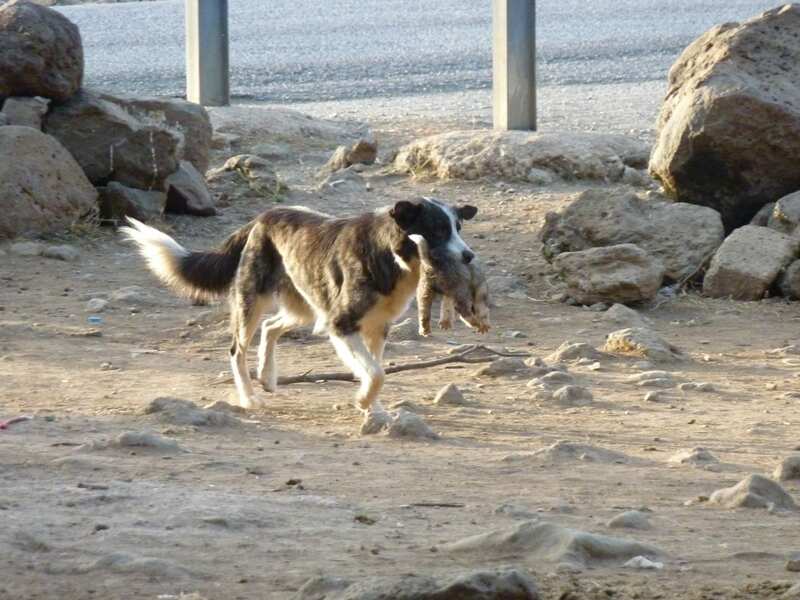 A relieved mother returning its puppy to the others. 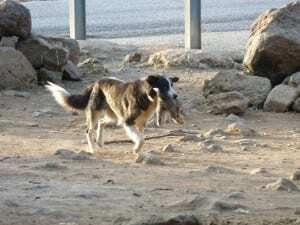 Why did Galack risk injury to protect the puppy from another species? It is really hard for scientists to really know what goes on inside a monkey’s (or any animal’s) head. How much of their behaviour is instinctive and how much of it actually goes through a thought process? The cooperative behaviour between these dogs and the tourist group is really interesting. It would be wonderful if we could go inside their heads and work out what drives their behaviour. Hello, this is very interesting! Do you know if the monkeys are grooming the dogs sometimes? In our facility the Barbary Macaques live together with another species and they are grooming them.